What kind of moron walks barefoot in the snow? I woke early on my first morning in Pamukkale and looked out the window for the promised and forecast morning sunshine. Instead I was greeted by a blanket of snow. Snow was clinging to power lines, ankle deep on footpaths and turning to slush in the gutters. It was a pretty special, and rare greeting for the famed hot spring travertines. I thought the ‘cotton castles’ looked more like a patch of snow anyway, and with the overnight fall it looked an even brighter white. 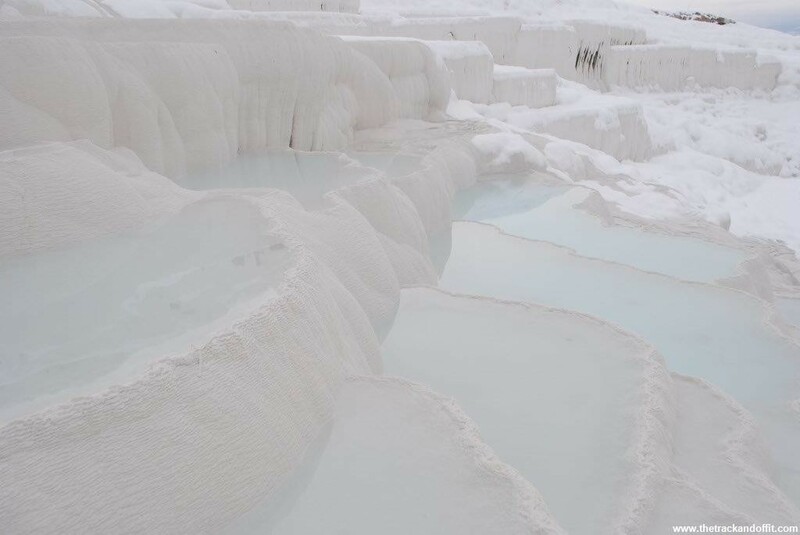 The Pamukkale travertines are formed by calcium deposits from the mineral rich water flowing down the hill from the ancient city of Hierapolis. 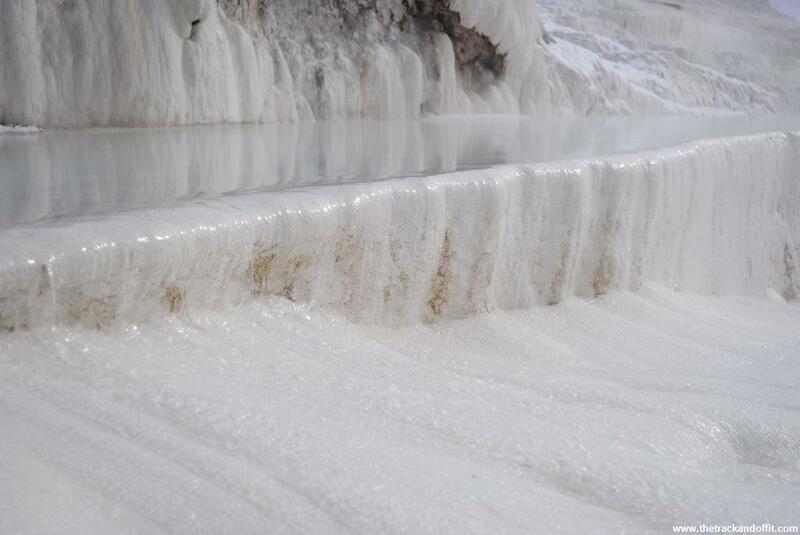 The warm water flows down the hill, leaving behind calcium which forms the saucer like dishes which then fill with water from the hot springs. 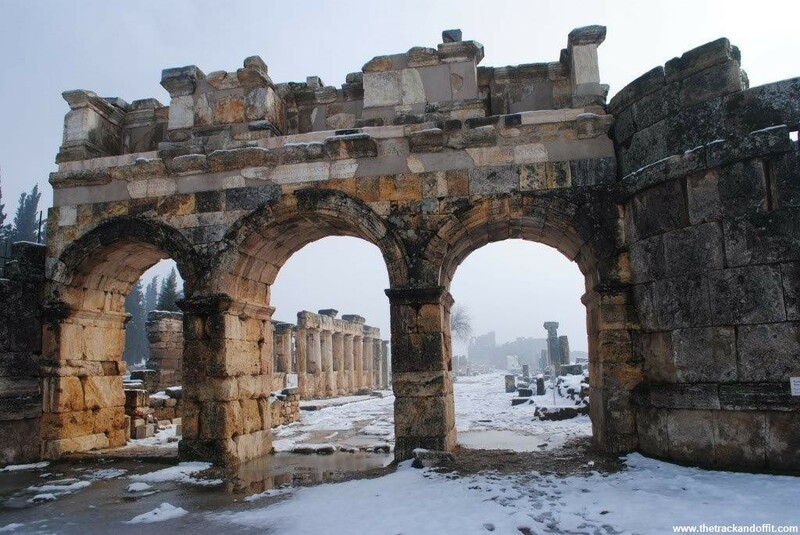 To protect the travertines, visitors must be barefoot as they climb past the pools and up to the ruins of Hierapolis. 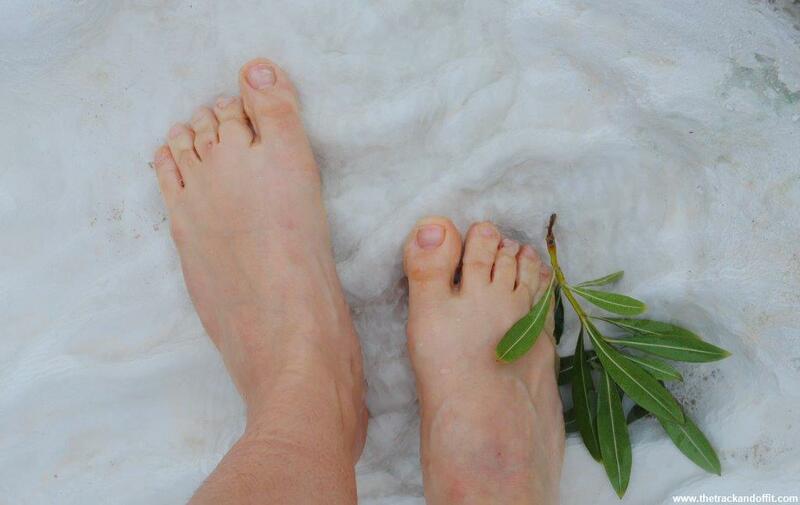 So that’s the kind of moron who walks barefoot in the snow. Although it was 10am, the warm water and sun had not yet melted much of the snow. 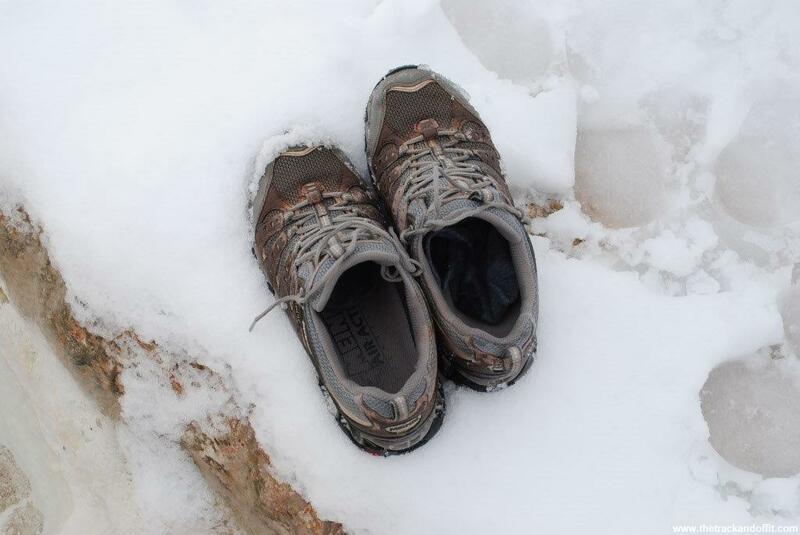 I skipped and jumped my way through patches of icy snow, following the steam indicating the hot springs. The higher I went the warmer the water got. Unfortunately, my hotel was wrong, you can’t walk just anywhere you like. Equally unfortunately, the most melted areas were a no go. At the sound of a guard’s whistle I turned and realised I had to slip and slide my way down though patches of snow and then follow the colder, deeper, snowier parts to the top. I wonder how long it takes for frostbite to set in? 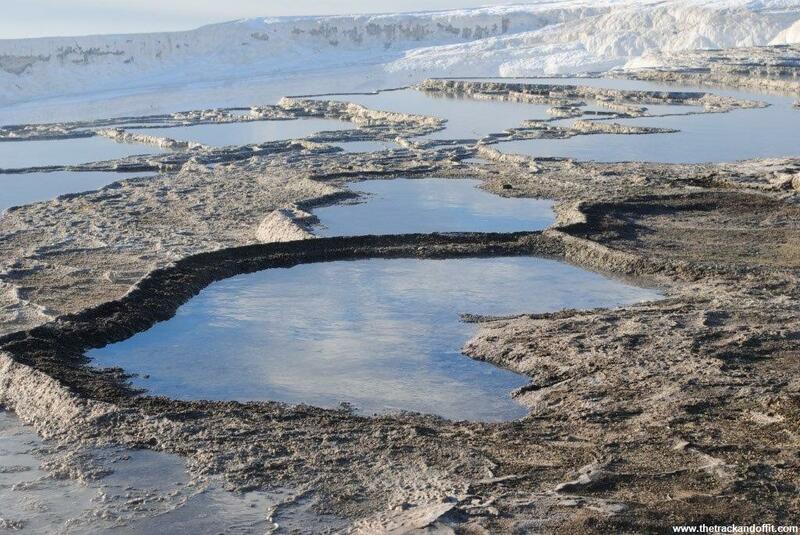 Some of the hot spring pools had a layer of ice across the top. 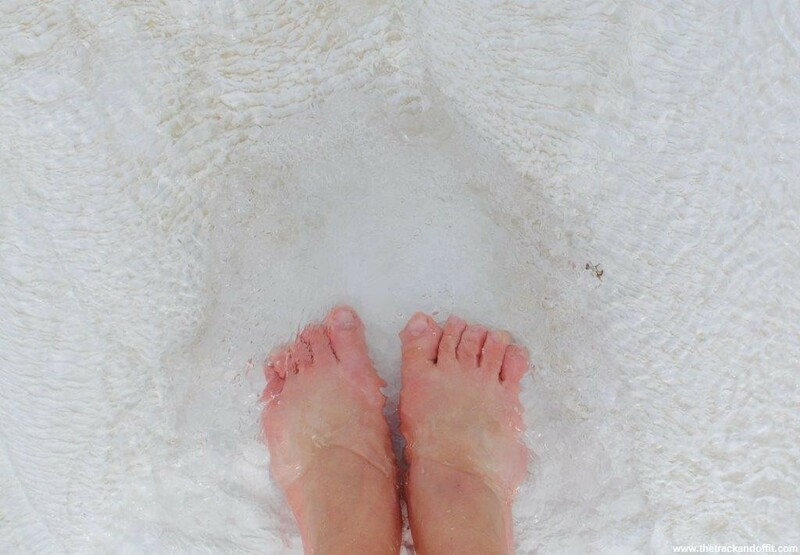 My poor pink toes could hardly move and I took every opportunity to soak them in patches of warm flowing water. About half way up the snow had melted in a lot more places, thanks to the cascading warm water, and I was able to avoid the risk of frostbite. 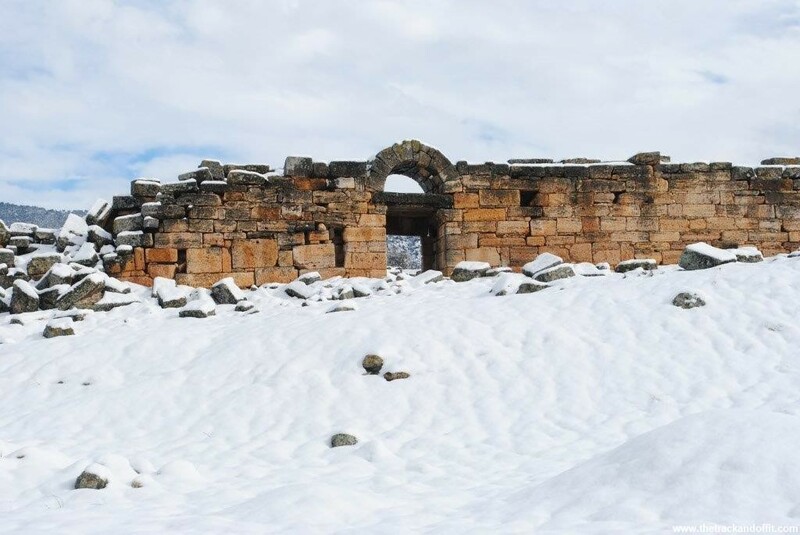 Hierapolis (where you can put your shoes back on) was stunning in it’s winter wonderland clothes. It was odd to see snow clinging to the tops of palm trees. 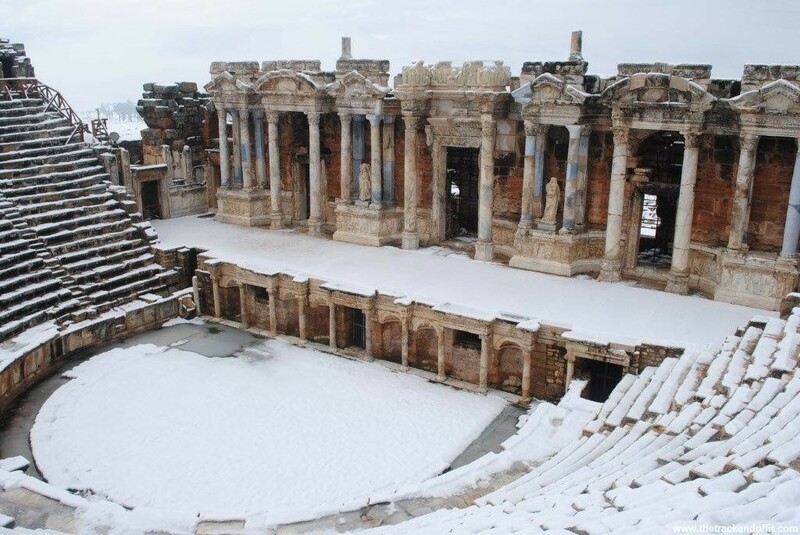 The paths had disappeared so I forged my way through snow drifts to explore the stunning theatre with it’s reconstructed marble statues. 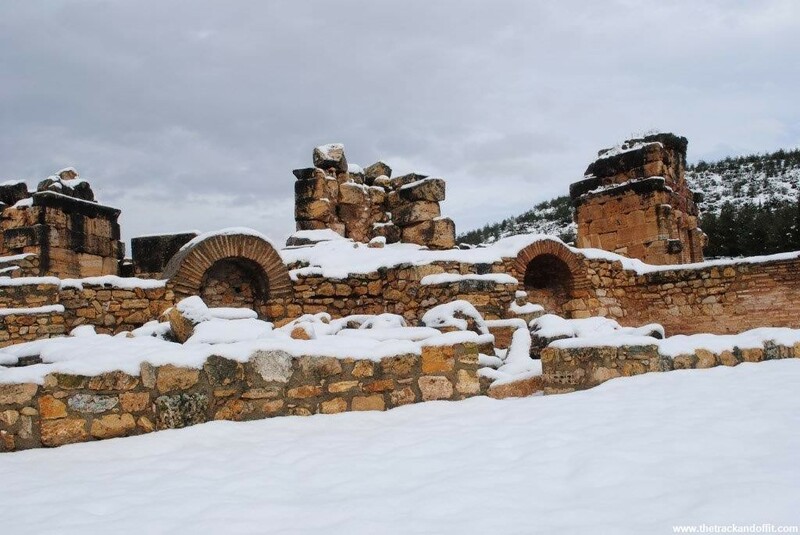 Some of the ruins themselves were also buried under snowdrifts. 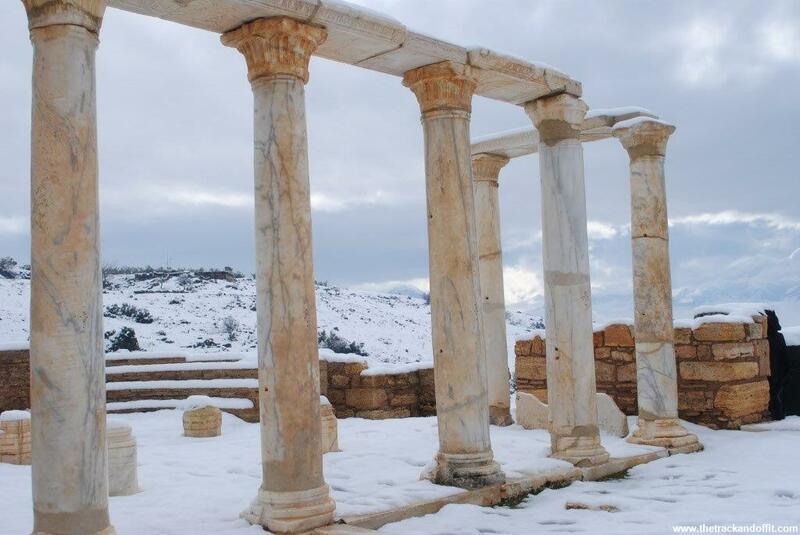 I climbed the hill to the St. Philip Martyrium, which was blissfully peaceful (I may have been the only person to wade higher up through the snow) and had great views across the ancient city. 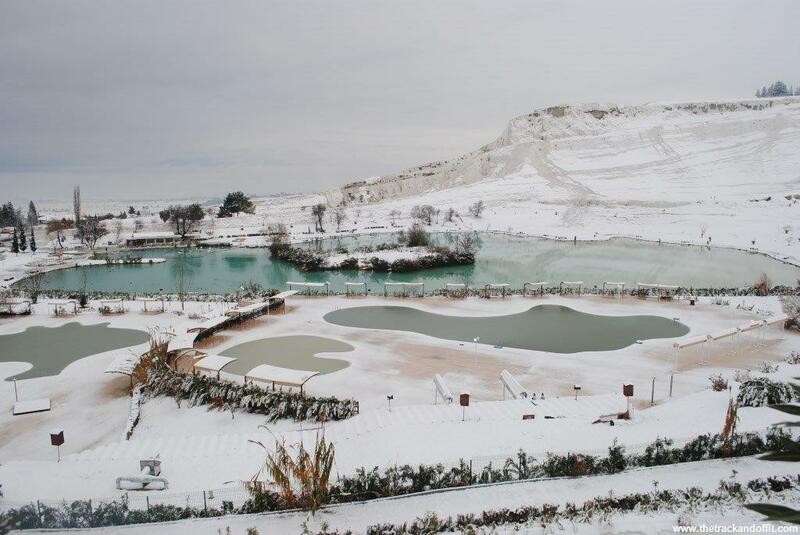 Although the sun was now warming the paths (and turning them bit slushy) and the hot springs doing their job it was too cold to sit in any of the travertine pools so I decided to pay the extra lira to swim in the Ancient Pool. The water was deliciously warm (about 36C), the minerals good for my skin, hair and nails and there were ancient stones and columns littering the bottom of the water. I spent an hour and half swimming and soaking up the decadence, imagining I was Cleopatra. Bliss. The walk back down the travertines wasn’t as evenful as the walk up. There were more crowds but less snow and more warm running water. The bottom half was still (literally) freezing cold and not many people were making the trip. I felt hard as nails, toughing out the ice for some spectacular scenery. 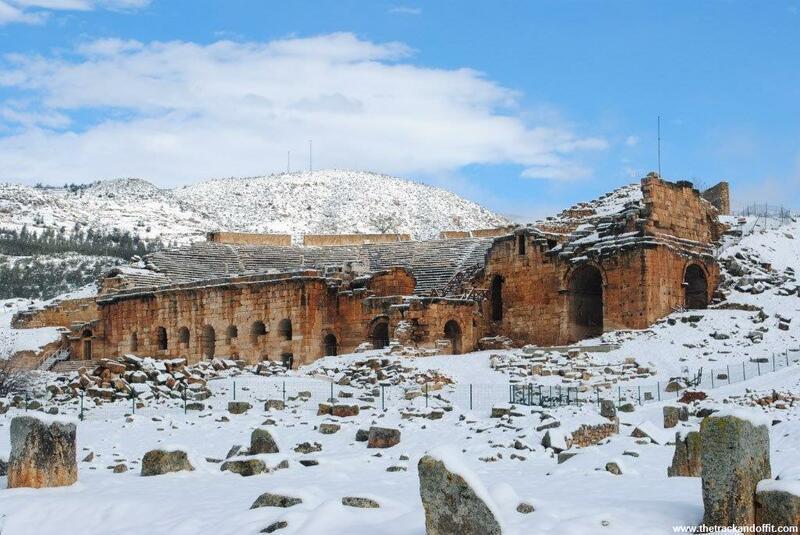 This entry was posted in My Travels and tagged Turkey by Simone. Bookmark the permalink. Awesome, I’d totally walk in the snow for those views. Amazing photos. Thanks! It was worth the frozen toes.